PupLight [PupLight] - $19.95 : NewDaVincis.com!, Great Innovative Products, Gadgets and more. Â PupLight is a small LED flashlight a dog carries on it's chest which lights the way and the dog for a safe and more enjoyable nighttime walk and it?s so convenient because the dog walker doesn't need to carry a flashlight to see ahead. PupLights Come In Red, Silver, Blue and BlackÂ . Please specify your choice of color. With PupLight it's easy to find your dog in the dark. 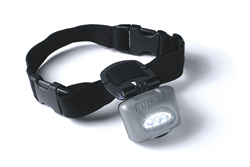 Additionally, PupLight protects your dog from cars off-leash because it projects a beam of light 20 ? 30 feet in front of the dog so cars can see the beam in plenty of time to stop for the dog. 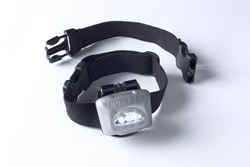 PupLight has 3 white LEDs which illuminate 200 feet forward, 70 feet to each side and last over 150 hrs on AAA batteries. It comes with a two piece adjustable band which fits almost any size dogs and easily slips over the dogs head, snaps on or can be attached to an existing collar. 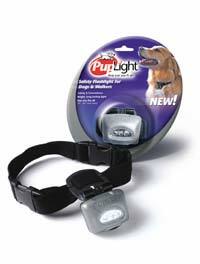 PupLight comes with a fur guard and the light can be angled up or down. Rugged, water resistant construction - gives years of service to even the most active dogs. Easy-on adjustable elastic band - assures a proper fit for any size dog. Batteries Last Over 24 Hours. Please do not forget toÂ specify your choice of color (black, blue, red or silver).